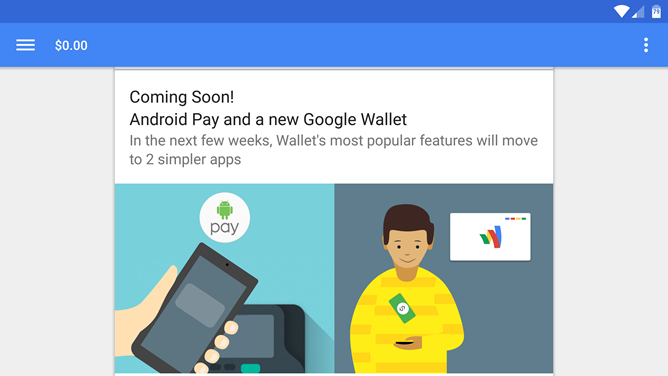 Have you opened Google Wallet lately? Yeah, neither have I. But those users who have are seeing a not-so-subtle hint from Google that the service's successor, Android Pay, is almost here. Open the latest version of Wallet and you'll see a banner for Android Pay, which appears to be a server-side push (since there's no corresponding update to the APK). The link goes to a web-based FAQ about Android Pay, mostly outlining the transition from Wallet. Also of note: a recently-leaked document that's claimed to be an internal Verizon Wireless memo says that Android Pay will be launching on September 16th (two Wednesdays from now). If you're wondering why Verizon cares when they so famously obstructed the launch of Google Wallet way back in the bygone days of the Galaxy Nexus, it's because Google bought a large chunk of the carrier-backed Softcard payment system (formerly Isis), and is now a de facto partner of Verizon, T-Mobile, and AT&T for mobile payments. Of course, we've seen at least one prospective launch date for Android Pay come and go, so take that with a grain of salt. There seem to be a lot of hurdles to overcome. [Weekend Poll] Will (Or Would) You Use Android Pay When It Launches?